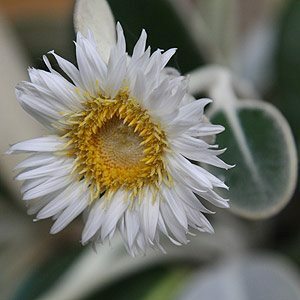 From New Zealand Pachystegia insignis is commonly called the ‘Marlborough Rock Daisy’, a low growing evergreen shrub with attractive rounded silvery green foliage with a lighter velvety underside and a strong white central vein. The leave are thick and leathery and the plant puts down a long tap root which assists with drought tolerance. This is a hardy plant given the right care and will reward the gardener with attractive foliage year round and a wonderful show of flowers. This is the most commonly grown of the genus which includes P.rufa and P. minor. Masses of single daisy like flowers from late spring through summer are a brilliant white with yellow centers appear above the foliage and are a standout through the season. A well drained soil is essential and Pachystegia insignis or ‘Marlborough Rock Daisy’ grows well in the rock garden as its name suggests. Will reach around .5 – .7m in height in most conditions although in an ideal position it can get to twice this size, with a similar spread. P. minor is a smaller growing species. Although the ‘Marlborough Rock Daisy’ can be grown in containers because of the tap root it is best in the garden. Try building up the soil with a few rocks to mimic its native environment. In Australia a position in full sun to afternoon shade is best, certainly with some protection from the hot afternoon sun in summer, but good morning sun and winter sun is essential. Excellent in coastal gardens, tolerates windy conditions and light frosts.